The assembly-line rhythms, sampled from a factory in Nuremburg, unshackled electric guitar, ringing sampler melody and percussion in the approximately five-minute excerpt from this work create a punk rock-like fare that contrasts sharply with the album’s title work, a chamber concerto with a cello part written for Felix Fan at its center. 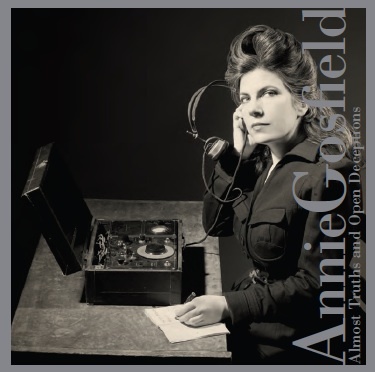 The title “Almost Truths and Open Deceptions” refers to the movement of the entire ensemble toward “a mass of open D strings,” as Gosfield explains. At the end of the 24-minute work, the instruments settle through wilting glissandos into a decaying unison that fades ghostlike. The concerto opens with brash string attacks, wild circling motives and pulsing forward motion that settles down deceitfully, foreshadowing the piece’s conclusion, before ceding to a cello that implores and groans. Intimate, folky exchanges between the piano, violin, and cello ensue in the course of the work’s impending movement, propelled through variegated rhythms and animated melodic writing, with a percussive interlude that teases the listener as much as it creates suspense. ‘Almost truths’ would also seem to apply to the album’s first track, “Wild Pitch” (2004), with its double-entendre in reference to “a baseball game gone mad” as well as the musical sense of the word. Fan again takes center stage along with the members of his trio “Real Quiet,” scraping out both tuned and quarter-toned figures against eerie piano (Andrew Russo), also played from the inside with a steel guitar slide among other objects, and high strung percussion (David Cossin). The excitability yields intermittently to meditative stasis, given an authentic flair with Chinese cymbals and broken gongs. Gosfield’s ability to foreground and manipulate pure instrumental sounds emerges even more clearly in “Cranks and Cactus Needles” (2000), inspired by the sounds of the now obsolete 78 RPM records and commissioned by the Stockholm-based ensemble The Pearls Before Swine Experience. Ripping, scratchy timbres in the strings evoke a record player on its last legs, while flute and piano play unaffected. Gosfield herself takes the keyboard for “Phantom Shakedown,” composed specifically for the album in 2010, over cosmic whirring, satellite bleeps, detuned piano, and machine rhythms, the piano’s heavy, if at time monotonous, chords moving through the samples as if drifting through a tunnel. Some subtleties in the frequencies of the samples may not be as palpable on recording as they are live, yet instrumental balance is generally well-struck throughout the album. The first minutes of the title track are excessively loud at first hearing, but upon grasping the music’s structural strains becomes an absorbing listen. The detoned shades of “Cranks and Cactus Needles” manage to carry through effectively, the keyboard deliberately raucous beneath ripping strings. Roger Kleier’s electric guitar grinds organically with the machine riffs in “Daughters of the Revolution,” while the technical and expressive range of Fan’s cello, featured in four of six tracks, provides visceral continuity throughout the spectrum of Gosfield’s endeavors. David Cossin’s percussion provides a full range of timbral variety and rhythmic energy, fueling this music’s appetite for lyrical noise. ‘Almost Truths and Open Deceptions’ is out Aug.28 on Tzadik Records and can be pre-ordered on Amazon.com. At a time when young musicians are grappling with the demands of audience development and changing business models, the Israeli Chamber Project (ICP) has created a flexible format that combines high quality performance and outreach into a single mission. Founded four seasons ago by young musicians based in New York, Berlin and Tel Aviv—most of whom graduated from Juilliard or the Manhattan School of Music—the octet divides its time between the concert hall and educational tours to rural parts of Israel, some of which are mostly Arab, that have little or no exposure to classical music. “It’s a response to a social-economic situation where there’s a kind of brain drain,” explains pianist Assaff Weisman, who also serves as the group’s executive director. “No one is left to teach there.” In turn, the chamber music society hopes to bring something of its native musical culture abroad, championing emerging Israeli composers and including pre-concert demonstrations. The ensemble, with two pianists, a clarinetist, and a harpist alongside a quartet of string players, can expand or shrink to suit a wide range of repertoire and has won praise for its inventive programming. 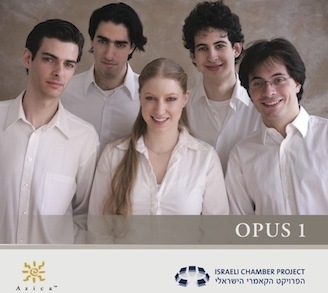 The group’s debut album Opus 1 features an originally-commissioned quartet by the Berlin-based composer Matan Porat alongside duets, trios and a sextet. The selection gives equal measure to late French Romaticism and Eastern European modernism, providing a fitting stylistic context for Porat’s Night Horses (2007). Dreamy piano arpeggios and rhapsodic lines in the clarinet over nearly imperceptible slides and tremoli in the strings yield to tangled melodies that deliberately evoke Messiaen’s Quatuor pour la fin du temps, as liner notes by Laurie Shulman explain. The work was originally inspired by an eponymous lecture by Jorge Luis Borges about the ‘nightmare’ as a ‘night horse’ that invades the psyche. The second movement features moaning strings and emphatic interlocking melodies that seem desperate to escape as the piano gallops along until a soft, waking clarinet melody resolves the emotional turmoil. Martinu’s Musique de Chambre No.1, scored for clarinet, harp, piano and string trio, provides the ensemble with another outlet for vibrant, free-ranging yet highly idiomatic musicianship. Folk rhythms emerge spontaneously alongside neo-impressionist elements, while the mysterious timbre and meditative stasis of in the inner Andante movement underscores the music’s unusual instrumentation. Bartok’s Contrasts for violin, clarinet and piano, the only chamber work in which the composer involved a wind player, also features a slow-fast rhapsodic structure with a Pihenö (Relaxation) inner movement. The late Bartokian fare can barely contain its energy in the final movement as both violinist and clarinetist respectively alternate between two instruments, a detuned fiddle adding a searing touch of nostalgia. The album is balanced with the soothing mood of duets according special prominence to the harp. ICP harpist Sivan Magen performs in his own arrangement of Debussy’s Sonata for Cello and Piano, originally written in the composer’s last years after a spell of paralyzing depression. The harp’s dry, rippling timbre is not so convincing in the accompanying chords of the Prologue or the aggressive plucks that bring the final movement to a close but achieves a more compelling blend in the inner Sérénade. The Fantaisie for Violin and Harp of Saint-Saens, who as the liner notes explain was one of the few pianist-composers to write idiomatically for the harp, demonstrates a more conventional, and ultimately more consistently pleasing, use of texture. The members of the ICP perform with youthful energy and polished, expressive musicianship throughout the album. Magen reveals his mastery of the instrument in French repertoire and blends skillfully in Martinu’s Chamber Music No.1. Weisman anchors the ensemble sensitively in Porat’s Night Horses, while clarinetist and ICP Artistic Director Tibi Cziger nails the dance motives of the opening Verbunkos movement to Bartok’s Contrasts. The performance of this work stands out for its crisp, lively rhythms and effortless sense of structure. Violinist Itamar Zorman, winner of the 2011 Tchaikovsky Competition, also impresses in the thorny harmonics of the final movement. Balance problems between the contrasting timbres of the instruments emerge only in the Porat, where subtle violin timbres in the opening do not come through audibly enough. Such are the perils of recording contemporary music, although audio engineering could perhaps artificially address the problem. All considerations aside, ICP’s fresh approach to chamber music breathes life into an art form whose myriad possibilities often go underappreciated in mainstream classical music life. Opus 1 is already available for download and will be released on Azica Records July 31. This entry was posted on Friday, July 27th, 2012 at 9:30 am	and is filed under Berlin Times. You can follow any responses to this entry through the RSS 2.0 feed. Both comments and pings are currently closed.